^He didn't use dummies. He literally just put log(NAICS) as a variable. 3 years ago # QUOTE 11 Good 0 No Good ! He was probably just trying to have industry fixed effects but coded it wrong. In any event, it's a working paper and it likely will be corrected for the submission to QJE or JF. 3 years ago # QUOTE 0 Good 7 No Good ! No, it's not a coding mistake. There is a table in his paper that lists log(NAICS) as an independent variable. 3 years ago # QUOTE 18 Good 0 No Good ! Definitely not, as he used the specificatin several times in the paper and even "explained" it vaguely. In a community that claims to place the most value on intellectual capital, this is worst example of the prevalence of cronyism in finance academia to date. One can only hope that it will help expedite the collapse of the inflexible H/M/LRM hierarchy that allows these things to happen and often prevents the best work in the field from emerging. 3 years ago # QUOTE 9 Good 0 No Good ! The pdf circulated before was a WP version from a brown bag seminar. Current version has NAICS fixed effects. Incredibly stupid mistake, sure. But a 'scandal'? I don't think so. 3 years ago # QUOTE 1 Good 4 No Good ! I'm skeptical about the corruption theory of ES's hiring. Surely the more likely story is that HBS and whoever else failed to spot the error before offering the job? This is highly embarrassing in itself, though in their defense the error is so ludicrous it's not the kind of thing they would have been looking for. If they're now saying that they think the error is no big deal then they may just be trying to save face. It's a serious embarrassment that he was awarded the AQR award. 3 years ago # QUOTE 8 Good 0 No Good ! Good one. I like his damage/health distribution. It is more likely that he is lying. If he's not, then to have an adjusted R^2 of less than 1% with only 288 observations AND industry fixed effects suggests that his sample is not representative and contains few industries. 3 years ago # QUOTE 10 Good 1 No Good ! Right on point. He "fixed" his specification by changing the footnote in his table. The whole thing is very suspicious. Also, for years Emil was planning to go on the market with his Greenbaum-finalist paper as others have already noted. Why he didn't do it and cooked up a new paper in less than a year is very suspicious. So he went on the market with 3 papers, of which 2 are likely fictitious? Shouldn't the OFR permit access to Emil's dataset? Emil could then post his regression sample for replication. Or the OFR would jump in Emil's support camp and "promote financial stability" through aiding the publication of fictitious results? It also turns out that the original EJMR thread discussing the issue was deleted. Did any other thread get deleted in that fashion as well? Very very suspicious. 3 years ago # QUOTE 6 Good 0 No Good ! I think the fact he took the log means he actually put some thought into it. That is either the scariest part of all this or the strongest evidence of what it means to be a reg monkey. 3 years ago # QUOTE 12 Good 0 No Good ! 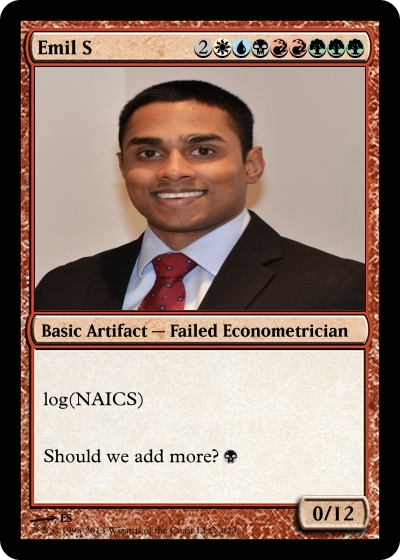 I am a non-economist and have no idea what NAICS stands for. Can someone explain to me why it is so obviously wrong to use log(NAICS)? Assume a strong math background but little to no training specifically in econometrics or statistics on my part. It would be roughly analogous to using a person's social security number in trying to explain/predict that person's wage. Put another way, it would be similar to: "women make $0.77 per dollar that a man does" and the interlocutor asking "ok, but did you control for social security number?" Social security numbers, like NAICS codes, are nominal variables that have no inherent meaning or natural order. They are aribtrarily assigned. 3 years ago # QUOTE 16 Good 0 No Good ! I've said it before and I'll say it again: reg monkeys do not belong in academia. I'm sorry to say this because I'm sure some of them are Ok, but this type of research is not well aligned with the traditional aims of academia. Good theoretical research in econometrics with some clarifying examples/applications is completely legit, but pure reg monkey work has no place in University research. Reg monkeys should go work in industry. 3 years ago # QUOTE 13 Good 1 No Good ! It would be roughly equivalent to a time trend. Better analogy: In a parallel universe where ES was a labor economist, he ran a wage regression with a log(ZIPCODE) instead of ZIP code dummies. 3 years ago # QUOTE 15 Good 0 No Good ! The log() detail is classy!